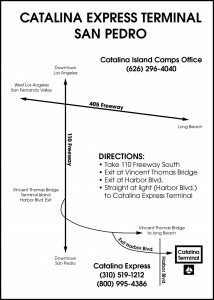 The San Pedro Catalina Express terminal is located at Berth 95. Exit the Harbor Fwy (CA110) south at Harbor Blvd and proceed straight through the traffic light. The terminal is under the Vincent-Thomas Bridge.